All the facts and nothing useful. Many companies are swimming in data they don't know how to analyze. Not in a non-linear fashion. Sometimes a little creative thinking can derive interesting statistics and determine trends from the most mundane collection of facts. Intelligence operations use these methods all the time, but business less so. Most decisions made in the boardroom are closed decisions - meaning nothing outside one's own firm is taken into account in a specific sense. Companies operate on general assumptions about markets, the competition, upcoming products, and they never really analyze the details. Often, they don't know how to accomplish that task. That's where Rivette Marketing Group can come in handy. We will look over the information you've gathered, make some suggestions on how to proceed or supplement it, and then start planning based on the answers. Creative thinking isn't routine or easy, but at RMG we do it every day, and can show that our specific ideas create tangible results. The confidentiality of all Rivette Marketing Group (RMG) visitors is strictly protected. The individuals featured on this Web site are volunteers who have given RMG their permission to appear. Testimonial statements and photographs are provided without warranty as to their accuracy. Past performance by RMG does not constitute a warranty of the outcome of any future project in which RMG participates. This pages states the Terms and Conditions under which you may use this Web Sites. Please read this page carefully. If you do not accept the Terms and Conditions stated here, do not use the Web Site. RMG may revise these Terms and Conditions at any time by updating this posting. You should visit this page periodically to review the Terms and Conditions, because they are binding on you. The information on this web site is for educational, informational and private use only. At no time should information appearing on our web-site and/or e-mail correspondence be interpreted as a recommendation for our services. RMG, or any of its employees, shall not be held responsible for lost and/or damaged digital photos that the user does not deem adequate/satisfactory. RMG is not responsible for mis-directed and/or mis-routed e-mails. RMG advises any User who wishes to send materials first contact us via email as to the content of their inquiry before forwarding materials. Section 1. Use of Material. RMG authorizes you to view and download a single copy of the material on this Web Site solely for your personal, noncommercial use. Special rules may apply to the use of certain software and other items provided on the Web Site. Any such special rules are listed as "Legal Notices" on this Web Site and are incorporated into this Agreement by reference. The contents of this Web Site, such as text, graphics, images, and other materials, are protected by copyright under both United States and foreign laws. Unauthorized use of the Material may violate copyright, trademark, and other laws. You must retain all copyright and other proprietary notices contained in the original Material on any copy you make of the Material. You may not sell or modify the Material or reproduce, display, publicly perform, distribute, or otherwise use the Material in any way for any public or commercial purpose. The use of the Material on any other Web Site or in a networked computer environment for any purpose is prohibited. Section 2. Company's Liability. The Material may contain inaccuracies or typographical errors. RMG makes no representation about the accuracy, reliability, completeness, or timeliness of the Material or about the results to be obtained from using the Web Site and the Material. The use of the Web Site and Material is at your own risk. Changes are periodically made to the Web Site and may be made at any time. RMG DOES NOT WARRANT THAT THE WEB SITE WILL OPERATE ERROR-FREE OR THAT THIS WEBSITE AND ITS SERVER ARE FREE OF COMPUTER VIRUSES AND OTHER HARMFUL GOODS. IF YOUR USE OF THE WEB SITE OR THE MATERIAL RESULTS IN THE NEED FOR SERVICING OR REPLACING EQUIPMENT OR DATA, RMG IS NOT RESPONSIBLE FOR THOSE COSTS. THE WEB SITE AND MATERIAL ARE PROVIDED ON AN 'AS IS' BASIS WITHOUT ANY WARRANTIES OF ANY KIND. RMG AND ITS SUPPLIERS, TO THE FULLEST EXTENT PERMITTED BY LAW, DISCLAIM ALL WARRANTIES, INCLUDING THE WARRANTY OF MERCHANTABILITY, NON-INFRINGEMENT OF THIRD PARTIES RIGHTS, AND THE WARRANTY OF FITNESS FOR PARTICULAR PURPOSE. RMG AND ITS SUPPLIERS MAKE NO WARRANTIES ABOUT THE ACCURACY, RELIABLITY, COMPLETENESS, OR TIMELINESS OF THE MATERIAL, SERVICES, SOFTWARE, VIDEO, MULTIMEDIA, TEXT, GRAPHICS, AND LINKS. Section 3. Disclaimer of Consequential Damages. IN NO EVENT SHALL THE OWNER, ITS SUPPLIERS, OR ANY THIRD PARTIES MENTIONED AT THIS SITE BE LIABLE FOR ANY DAMAGES WHATSOEVER (INCLUDING, WITHOUT LIMITATION, INCIDENTAL AND CONSEQUENTIAL DAMGES, LOST PROFITS, OR DAMGES RESULTING FROM LOST DATA OR BUSINESS INTERRUPTION) RESULTING FROM THE USE OR INABILITY TO USE THE WEB SITE AND THE MATERIAL, WHETHER BASED ON WARRANTY, CONTRACT, TORT, OR ANY OTHER LEGAL THEORY, AND WHETHER OR NOT THE OWNER IS ADVISED OF THE POSSIBILTY OF SUCH DAMAGES. Section 4. User Submissions. Generally, any communication which you post to the Web Site is considered to be non-confidential. If particular Web pages permit the submission of communications which will be treated by RMG as confidential, that fact will be stated in "Legal Notices" on those pages. By posting communications to the Web Site, you automatically grant RMG a royalty-free, perpetual, irrevocable nonexclusive license to use, reproduce, modify, publish, edit, translate, distribute, perform, and display the communication alone or as part of other works in any forms, media, or technology whether now known or hereafter developed, and to sublicense such rights through multiple tiers of sublicenses. As a User, you are responsible for your own communications and are responsible for the consequences of their posting. You must not do the following things: Post material that is copyrighted, unless you are the copyright owner or have the permission of the copyright owner to post it; post material that reveal trade secrets, unless you own them or have the permission of the owner; post material that infringes on any other infringes on any other intellectual property rights of others or on the privacy or publicity rights of others; post material that is obscene, defamatory, threatening, harassing, abusive, hateful, or embarrassing to another User or any other person or entity; post a sexually-explicit image; post advertisements or solicitations of business; post chain letters or pyramid schemes; or impersonate another person. RMG does not represent nor guarantee the truthfulness, accuracy, or reliability of any of communications posted by other Users or endorse any opinions expressed by Users. You acknowledge that any reliance on material posted by other Users will be at your own risk. RMG does not screen communications in advance and is not responsible for screening or monitoring material posted by Users. If notified by a User of communications which allegedly do not conform to this Agreement, RMG may investigate the allegation and determine in good faith and its sole discretion whether to remove or request the removal of the communication. RMG has no liability or responsibility to Users for performance or nonperformance of such activities. RMG reserves the right to expel Users and prevent their further access to the Web Site for violating this Agreement or the law and the right to remove communications which are abusive, illegal, or disruptive. There are no methods for direct posting, such as a guestbook or other avenue available to the general public as of June 1, 2003. All submissions, i.e. Questions, are reviewed for appropriateness and may or may not be included on our Web Site. All decisions made by RMG regarding content are final. No submission of any material should be construed as a guarantee that said material will be posted or even warrant a response. No accepted submission shall constitute the basis for any future submission by any party. Section 5. Links to Other Sites. The Web Site contains links to third party Web sites. These links are provided solely as a convenience to you and not as an endorsement by RMG of the contents on such third-party Web sites. RMG is not responsible for the content of linked third-party sites and does not make any representations regarding the content or accuracy of materials on such third-party Web sites. If you decide to access linked third-party Web sites, you do so at your own risk. Section 6. Software Licenses. All software that is made available for downloading from the Web Site ("Software") is protected by copyright and may be protected by other rights. The use of such software is governed by the terms of the software license agreement or designated "Legal Notice" accompanying such software ("License Agreement"). The downloading and use of such software is conditioned on your agreement to be bound by the terms of License Agreement. Section 7. Limitation of Liability. Unless otherwise expressly provided in a Software License or Legal Notice, the aggregate liability for RMG to you for all claims arising from the use of the Materials (including software) is limited to $1. Section 8. Indemnity. 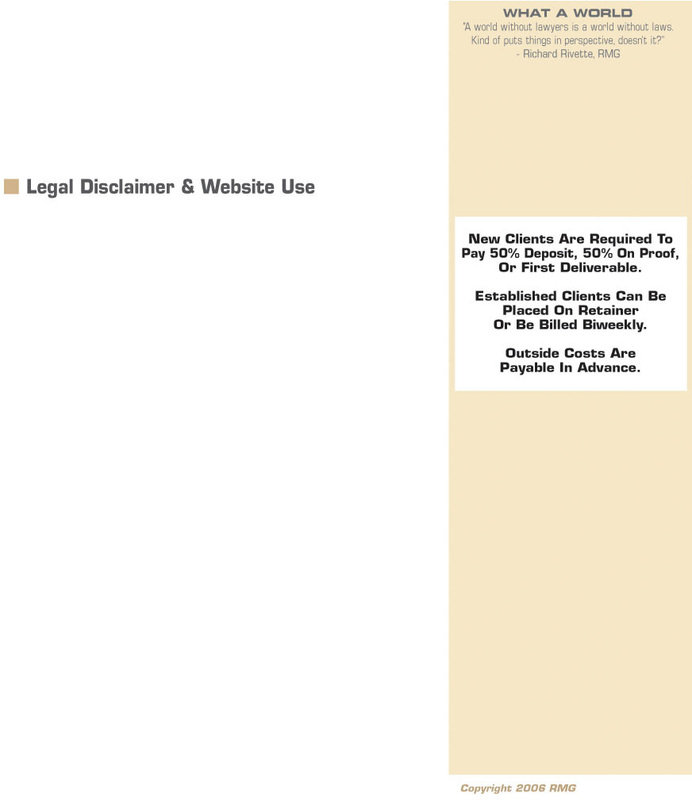 You agree to defend, indemnify, and hold harmless RMG, its officers, directors, employees and agents, from and against any claims, actions or demands, including without limitation reasonable legal and accounting fees, alleging or resulting from your use of the Material (including Software) or your breach of the terms of this Agreement. Section 9. Export Control. The United States controls the export of products and information. You agree to comply with such restrictions and not to export or re-export the Materials (including Software) to countries or persons prohibited under the export control laws. By downloading the Materials (including Software), you are agreeing that you are not in a country where such export is prohibited or are a person or entity to which such export is prohibited. You are responsible for compliance with the laws of your local jurisdiction regarding the import, export, or re-export of the Product. Section 10. User Information. RMG may use the information it obtains relating to you, including your IP address, name, mailing address, email address, personal data, address, phones, other details listed on our online forms, and use of the Web Site, for its internal business and marketing purposes, but will not disclose the information to third parties. No outside person or service will contact you in regards to our services. If a User is approached regarding our services by anyone other than the owner, please contact RMG immediately. Section 11. General. This Web Site is based in Georgia. RMG makes no claims the Materials are appropriate or may be downloaded outside of the United States. Access to the Materials (including Software) may not be legal by certain persons or in certain countries. If you access the Web Site from outside of the United States, you do so at your own risk and are responsible for compliance with the laws of your jurisdiction. This agreement is governed by the internal substantive laws of the State of North Carolina, without respect to its conflict of laws principles. If any provision of this Agreement is found to be invalid by any court having competent jurisdiction, the invalidity of such provisions shall not affect the validity of the remaining provisions of this Agreement, which shall remain in full force and effect. No waiver of any term of this Agreement shall be deemed a further or continuing waiver of such term or any other term. Except as expressly provided in a particular "Legal Notice" or Software License or material on particular Web pages, this Agreement constitutes the entire Agreement between you and RMG with respect to the use of Web Site. Any changes to this Agreement must be made in writing, signed by an authorized representative of RMG.